This diagram shows how units conform to linear, and area terrain. 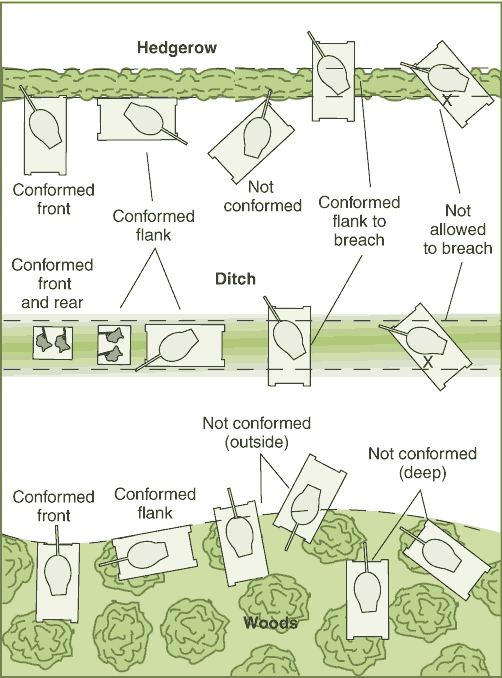 The front, flank, or rear of a unit's base must align (conform) to the edge of a terrain feature to receive the benefit of cover or concealment. Breaching a linear terrain feature requires that the unit be oriented perpindicular to the object so that the terrain feature will cross the unit's flanks at a 90 degree angle. Conforming to an area terrain requires that the unit align either its front or flank with the edge of the area.